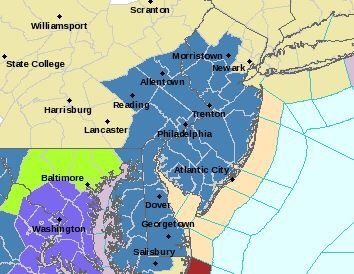 A winter storm warning has been issued by the National Weather Service for effectively all of New Jersey, with Ocean County forecast to receive 8-12 inches of snow between Friday and Sunday. The watch has been issued for 7 p.m. Friday through Sunday morning. According to the watch, central New Jersey will receive 8-12 inches of snow while 12-16 inches were forecast for areas in the western portion of the state, along the I-95 corridor. Snow will begin, the NWS said, after the evening commute Friday and continue – heavy at times – through Sunday morning. Winds will be sustained at up to 40 m.p.h. and gust to 55 m.p.h. Winds will blow from the northeast, pushing water into the back bays which, combined with a full moon, will lead to moderate to major coastal flooding. Wave heights in the ocean will build to 7-14 feet Friday and 14-29 feet on Saturday. Storm force winds are possible Saturday.